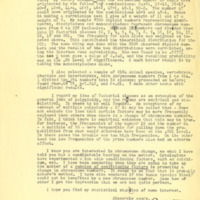 Letter from N. Timofeeff-Ressovsky to H.J. Muller. 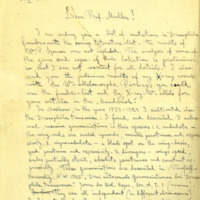 Handwritten letter from N. Timofeeff-Ressovsky to H.J. Muller regarding Drosophila genetics, 1930. 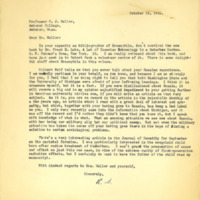 Letter from Ramsay Spillman to H.J. Muller. 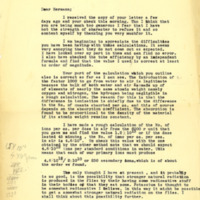 Typed letter from Ramsay Spillman to H.J. Muller regarding Muller's difficulty finding a job due to his connection with Russia, 1941. Tags: Muller, H. J. (Hermann Joseph), 1890-1967~ Penniston, John B. Letter from H.J. Muller to Irwin Oster. Handwritten letter from H.J. Muller to Irwin Oster Drosophila genetics, 1954. Handwritten letter from H.J. Muller to Irwin Oster Drosophila genetics, 1954. 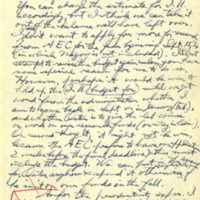 Handwritten letter from H.J. Muller to Irwin Oster, 1954. Handwritten letter from H.J. Muller to Irwin Oster, 1954. Handwritten note from H.J. 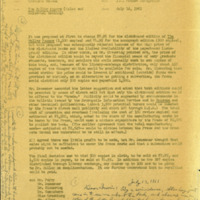 Muller to Irwin Oster on a copy of letter from July 12, 1961. Handwritten letter from H.J. Muller to Irwin Oster regarding Drosophila genetics, 1954. 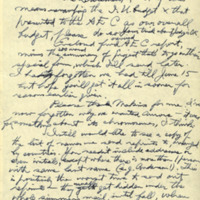 Handwritten letter from H.J. Muller to Irwin Oster regarding Drosophila genetics, 1954. Tags: Muller, H. J. 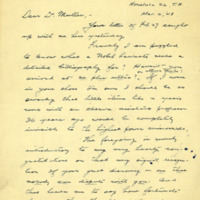 (Hermann Joseph), 1890-1967~ Murlin, John R.
Letter from Lewis Mott-Smith to H.J. Muller. 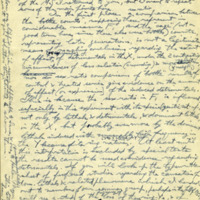 Typed letter with handwritten calculations in the margin from Lewis Mott-Smith to H.J. Muller, 1929. 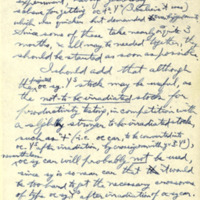 Typed letter with handwritten calculations in the margin from Lewis Mott-Smith to H.J. Muller, 1929.